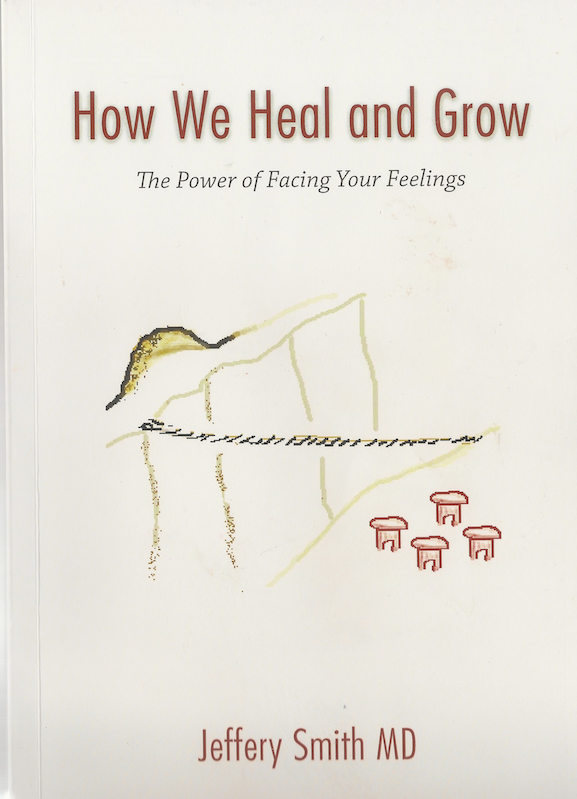 How We heal and Grow : The Power of Facing Your Feelings by Jeffery Smith, M.D. I was recently asked by my colleague and friend Dr. Jeffrey Smith, to write the Foreword for this new book that he has written. I was pleased to find it an excellent book. He offers a fresh and sensible way to look at how people develop dysfunctional patterns and facing feelings that have been avoided is the pathway to healing growth. He covers the full range of human problems from quirks to serous personality issues. He discussed the work of Freud, Mahler, Kernberg and many others including his own work. Interestingly the book is directed towards the lay public and I am sure will be received. However it really also belongs in the hands of therapists and any mental health professional who is involved with therapy. Dr. Smith has been teaching this subject to psychiatry residents and other psychotherapists for many years and is always very well received. He approaches the subject from a developmental point of view. He points out how most of us have pockets of immaturity and how to outgrow them. Dr. Smith discusses how and why the minds resist change. One of the central themes of Dr. Smith’s explanations is the phenomenon of catharsis where our underlying raw unprocessed feelings emerge and lose their power over us and are transformed when we share them with a therapist in the context of connection and safety. He describes this process and how it brings about an almost immediate change to the pathological emotions. I tend to look at the need for catharsis as something that has to occur over and over again which we often refer to as working through process. We do both agree that catharsis is an ongoing part of therapy. While this therapeutic work does require the empathic presence of the therapist. Dr. Smith also examines how some of this work may be able to done singularly when the person is trained in mindfulness in the Yoga and Buddhist tradition. The range and scope of the book is quite wide. He includes discussion of anxiety symptoms, trauma and depression although I felt he was little light on this latter subject particularly in regard to the role of loss. There is fascinating discussion on the dynamics of Multiple Personality Disorder in which he is a one of the few therapists with significant experience treating patients with this condition. Dr. Smith also brings his rich experience in treating addiction into the book. He shares where dynamics and developmental experience is important and where the here and now social interaction is crucial. Included in the book is one of the best discussions of conscience and superego that I have ever come across. There is also and excellent section on the narcissistic personality and a description of how to understand a parent who had this condition and how to deal with important people in your life who have it. This is really a unique book that should have great appeal to therapists, students learning therapy and people interested in understanding their own emotional issues as well as those around them. I can also picture how this book may be very useful for people entering therapy, It will alert them to what to look for in themselves. It may very well facilitate the therapeutic process. In fact, I plan to give a copy of it to some patients who enter therapy with me. I am very pleased to conclude that Dr. Smith has made an outstanding contribution to our profession as well as to the education of the public about mental health and the therapeutic process.